Cut the ends off of zucchini using a vegetable peeler, and slice each zucchini into thin, long strips. Lay zucchini on paper towel-lined plate while prepping the rest of the ingredients. 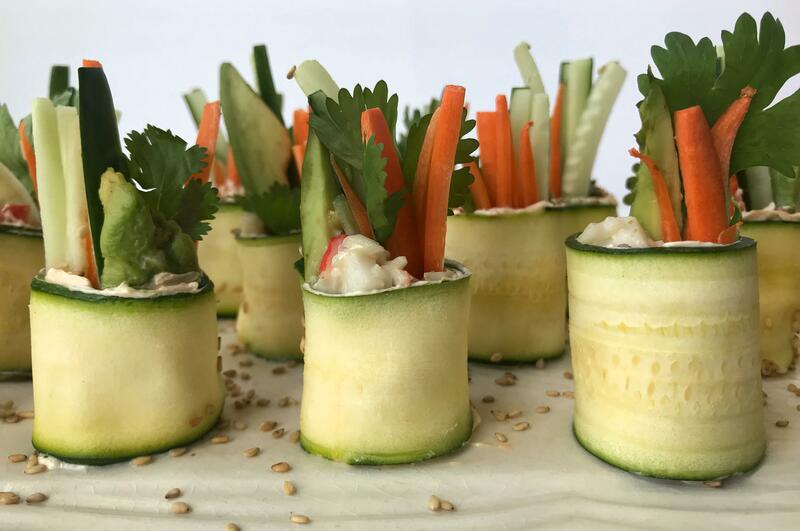 To assemble, lay zucchini strip flat and spread a thin layer of cream cheese over it, then top the left side with a pinch of crab mixture, a few matchstick veggies, an avocado slice and some cilantro. Tightly roll each zucchini slice from the left side in. Sprinkle with sesame seeds and serve with soy sauce and wasabi.